How does frequency of mitochondrial polymorphisms change from mother to child? Using Galaxy's main site we will see how to call variants in bacteria, viruses, and organelles. 2015 - Extensive tissue-related and allele-related mtDNA heteroplasmy suggests positive selection for somatic mutations. As an example of non-diploid system we will be using human mitochondrial genome as an example. However, this approach will also work for most bacterial and viral genomes as well. This figure from a manuscript by Olson:2015 contrasts the two approaches. In this tutorials we will take the first path is which we map reads against an existing assembly. Later in the course (after we learn about assembly approaches) we will try the second approach as well. The goal of this example is to detect heteroplasmies (variants within mitochondrial DNA). Mitochondria is transmitted maternally and heteroplasmy frequencies may change dramatically and unpredictably during the transmission, due to a germ-line bottleneck Cree:2008. As we mentioned above the procedure for finding variants in bacterial or viral genomes will be essentially the same. Zenodo contains datasets representing a child and a mother. These datasets are obtained by paired-end Illumina sequencing of human genomic DNA enriched for mitochondria. The enrichment was performed using long-range PCR with two primer pairs that amplify the entire mitochondrial genome. This means that these samples still contain a lot of DNA from the nuclear genome, which, in this case, is a contaminant. For this tutorial we have prepared a subset of data previously published by our group. Let’s import these data into Galaxy. Galaxy will prompt you to ask whether you want to import these data into already existing or new history. QC’ing reads using FastQC. Note that we selected all four datasets at once by pressing the middle button adjacent to the Short read data from your current history widget. Once FastQC job runs, you will be able to look at the HTML reports generated by this tool. 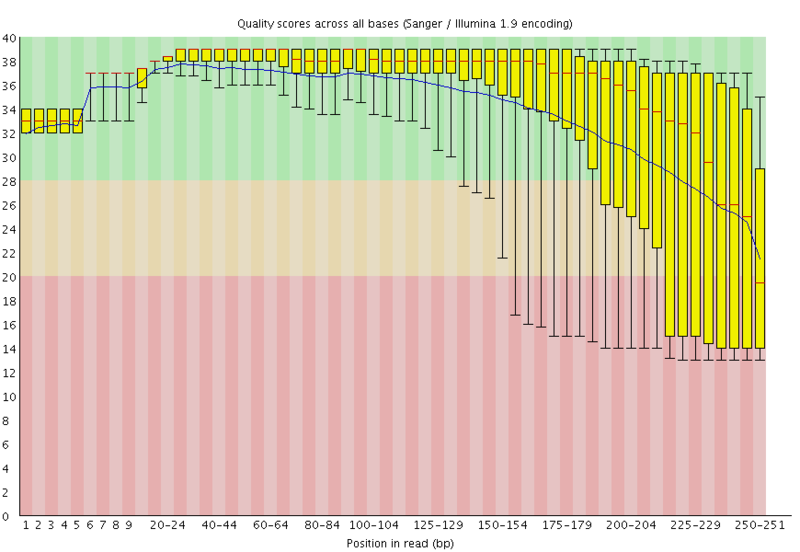 FastQC plot for one of the mitochondrial datasets shows that qualities are acceptable for 250 bp reads (mostly in the green, which is at or above phred score of 30). Our reads are long (250 bp) and as a result we will be using bwa mem to align them against the reference genome as it has good mapping performance for longer reads (100bp and up). By using the middle button again we select datasets 1 and 3 as Select the first set of reads and datasets 2 and 4 as Select the second set of reads. 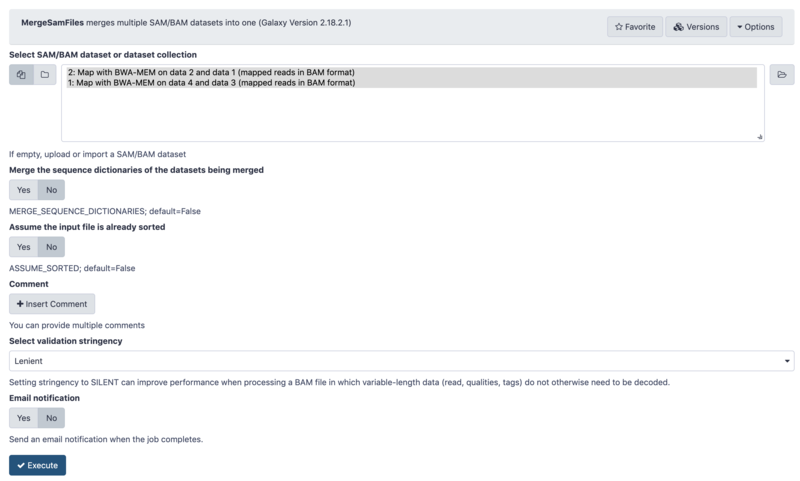 Galaxy will automatically launch two bwa-mem jobs using datasets 1,2 and 3,4 generating two resulting BAM files. 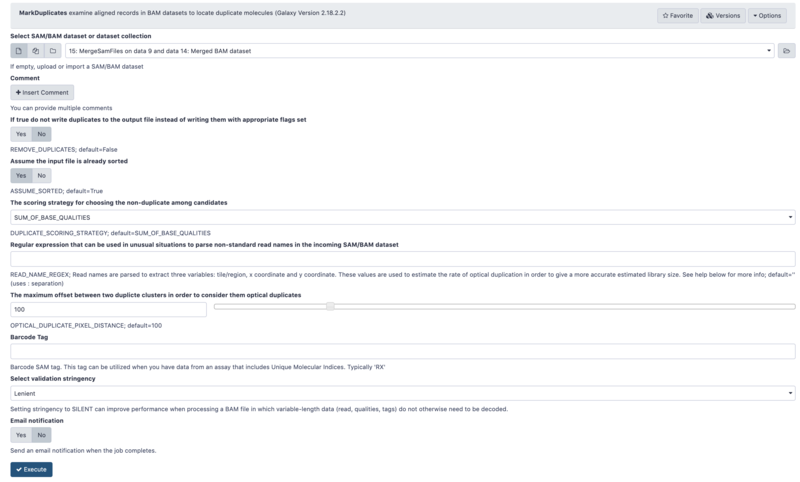 By setting Set read groups information to Set read groups (SAM/BAM specifications) and clicking Auto-assign we will ensure that the reads in the resulting BAM dataset are properly set. Because we have set read groups, we can now merge the two BAM dataset into one. This is because read groups label each read as belonging to either mother or child. Merging two BAM datasets into one. Note that two inputs are highlighted. 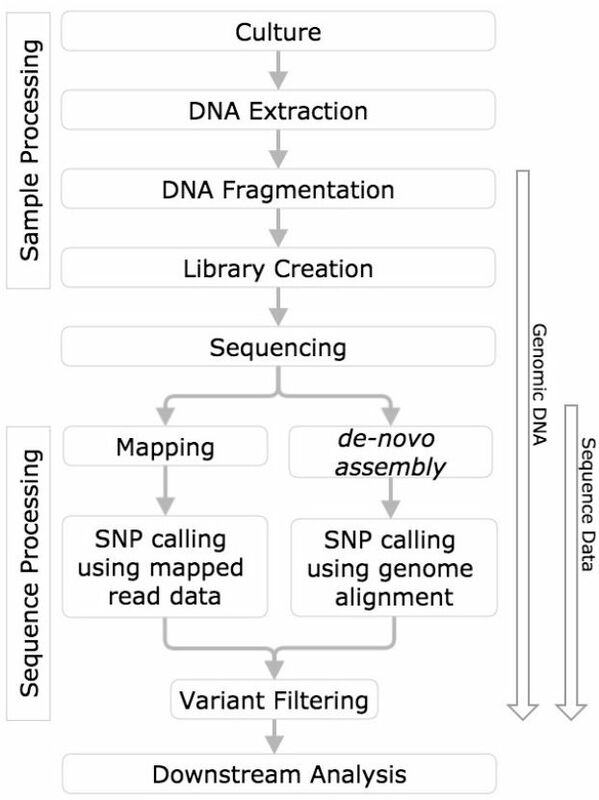 Preparation of sequencing libraries (at least at the time of writing) for technologies such as Illumina (used in this example) involves PCR amplification. It is required to generate sufficient number of sequencing templates so that a reliable detection can be performed by base callers. Yet PCR has its own biases, which are especially profound in cases of multi-template PCR used for construction of sequencing libraries (Kanagawa et al. 2003). Duplicates are identified as read pairs having identical 5’ positions (coordinate and strand) for both reads in a mate pair (and optionally, matching unique molecular identifier reads; see BARCODE_TAG option). Optical, or more broadly Sequencing, duplicates are duplicates that appear clustered together spatially during sequencing and can arise from optical/imagine-processing artifacts or from bio-chemical processes during clonal amplification and sequencing; they are identified using the READ_NAME_REGEX and the OPTICAL_DUPLICATE_PIXEL_DISTANCE options. The tool’s main output is a new SAM or BAM file in which duplicates have been identified in the SAM flags field, or optionally removed (see REMOVE_DUPLICATE and REMOVE_SEQUENCING_DUPLICATES), and optionally marked with a duplicate type in the ‘DT’ optional attribute. In addition, it also outputs a metrics file containing the numbers of READ_PAIRS_EXAMINED, UNMAPPED_READS, UNPAIRED_READS, UNPAIRED_READ DUPLICATES, READ_PAIR_DUPLICATES, and READ_PAIR_OPTICAL_DUPLICATES. Usage example: java -jar picard.jar MarkDuplicates I=input.bam \ O=marked_duplicates.bam M=marked_dup_metrics.txt. In other words the two datasets had ~6% and ~9% duplicates, respectively. The last of these is left-aligned. In this case gaps (dashes) as moved as far left as possible (for a formal definition of left-alignment and variant normalization see Tan:2015). mapQuality is set to ⋝ 20 Mapping quality reflects the probability that the read is placed incorrectly. It uses phred scale. Thus 20 is 1/100 or 1% chance that the read is incorrectly mapped. By setting this parameter to ⋝ 20 we will keep all reads that have 1% or less probability of being mapped incorrectly. Choose Complete list of all samples from Choose parameter selection level drop down. Mitochondria has a number of low complexity regions (mononucleotide repeats). Setting these parameters as described above will decrease noise from these regions. Exclude alignments from analysis if they have a mapping quality less than to 20 (phred score of 20). This will make FreeBayes to only consider reliably aligned reads. 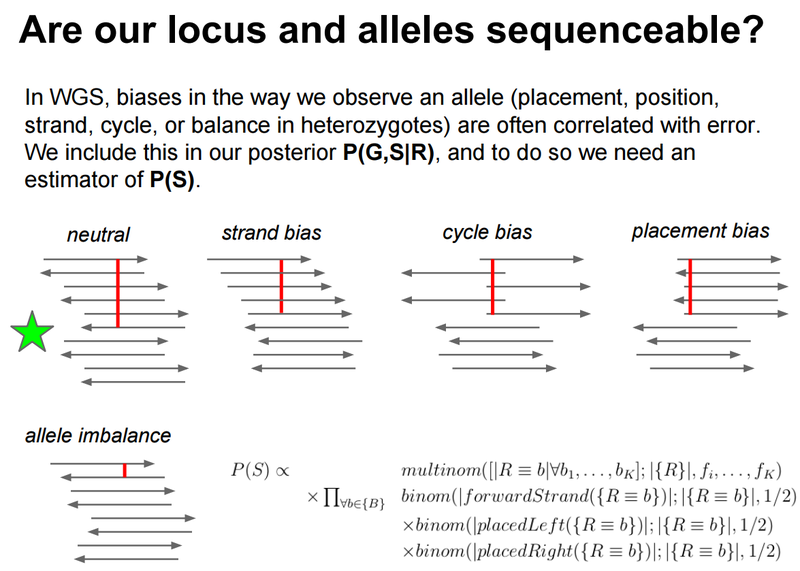 Exclude alleles from analysis if their supporting base quality less than to 30 (phred score of 30). This will make FreeBayes to only consider high quality bases. ##commandline="freebayes --bam localbam_0.bam --fasta-reference /galaxy/data/hg38/sam_index/hg38.fa --vcf /galaxy-repl/main/files/017/782/dataset_17782376.dat --region chrM:1..16000"
A robust tool set for processing VCF data is provided by vcflib developed by Erik Garrison, the author of FreeBayes. 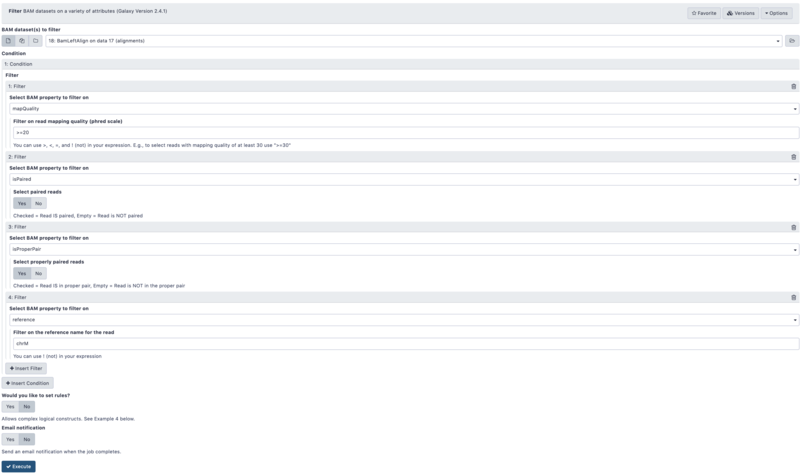 One way to filter VCF is using INFO fields of the VCF dataset. 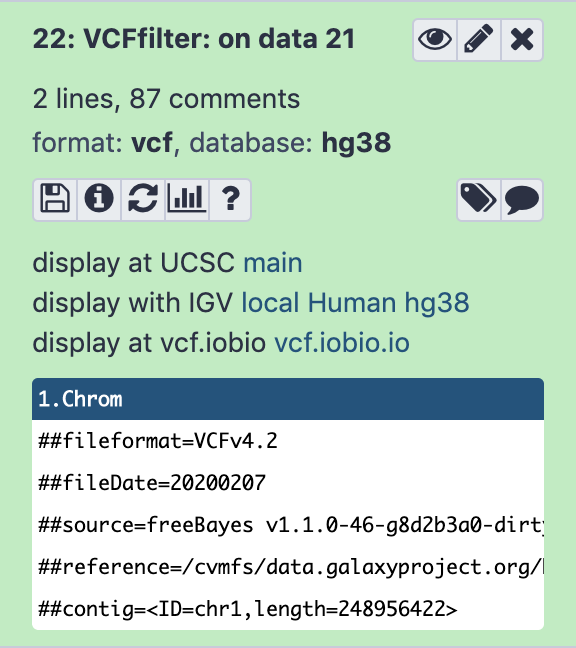 If you look at the VCF dataset shown above you will see all comment lines beginning with ##INFO. These are INFO fields. 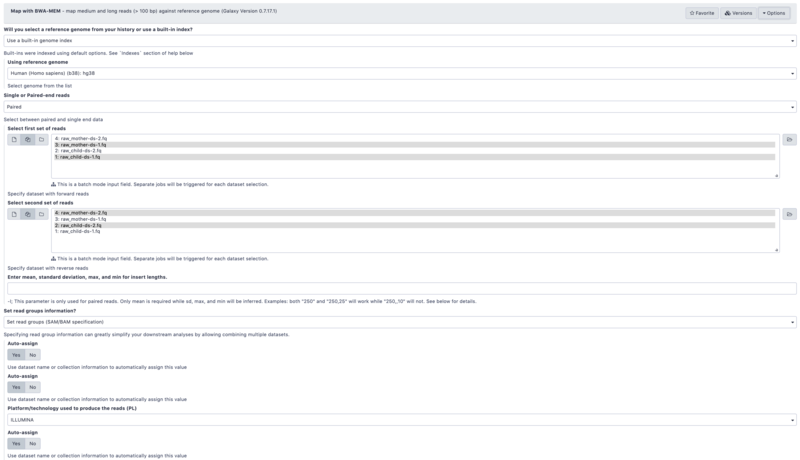 Each VCF record contains a list of INFO tags describing a wide range of properties for each VCF record. You will see that FreeBayes and NVC differ significantly in the number and types of INFO fields each of these caller generates. This why the two require different filtering strategies. ##INFO=<ID=DP,Number=1,Type=Integer,Description="Total read depth at the locus"> This is simply the number of reads covering a given site. ##INFO=<ID=SRP,Number=1,Type=Float,Description="Strand balance probability for the reference allele: Phred-scaled upper-bounds estimate of the probability of observing the deviation between SRF and SRR given E(SRF/SRR) ~ 0.5, derived using Hoeffding's inequality"> The higher this quantity the better the site as it diminishes the chances of the sites having significant strand bias. ##INFO=<ID=SAP,Number=A,Type=Float,Description="Strand balance probability for the alternate allele: Phred-scaled upper-bounds estimate of the probability of observing the deviation between SAF and SAR given E(SAF/SAR) ~ 0.5, derived using Hoeffding's inequality"> The higher this quantity the better the site as it diminishes the chances of the sites having significant strand bias (also see here). ##INFO=<ID=EPP,Number=A,Type=Float,Description="End Placement Probability: Phred-scaled upper-bounds estimate of the probability of observing the deviation between EL and ER given E(EL/ER) ~ 0.5, derived using Hoeffding's inequality"> The higher this number the lower the chance of having significant placement bias. QUAL - phred scaled variant quality. 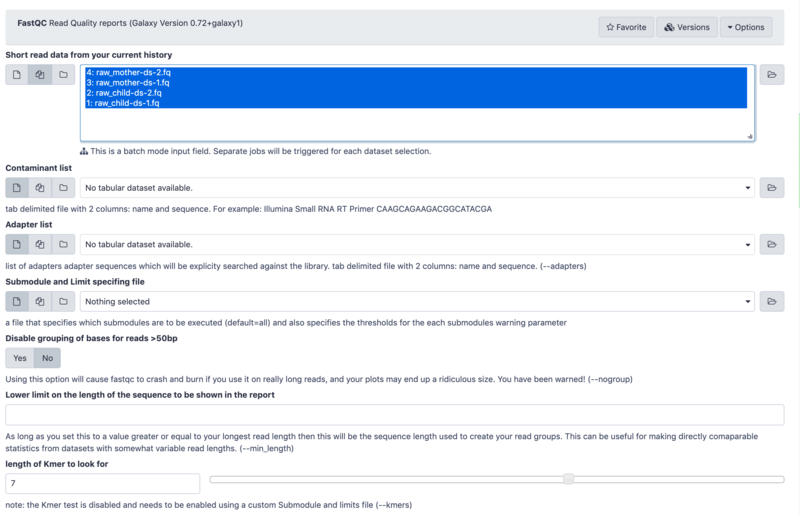 Filtering FreeBayes VCF for strand bias (SPR and SAP), placement bias (EPP), variant quality (QUAL), and depth of coverage (DP). For visualizing VCFs Galaxy relies on the two external tools. The first is called VCF.IOBIO and is developed by Gabor Marth’s group at the University of Utah. The second is called IGV developed by Broad Institute. Of course there are not that many variants to look at in this example. Nevertheless there are helpful statistics such as Transition/Transversion (Ts/Tn) ratio. Here we focus on one particular variant at position 3,243 for reasons that will become apparent in the next section. Visualizing VCF dataset may be a good way to get an overall idea of the data, but it does not tell a lot of details. For example, above we have visualized site 3,243 using IGV. It is interesting but we need to find out more. One thing we can do is to convert VCF dataset into a tab-delimited representation and play a bit more with it. There are 53 columns in this dataset (not all are shown here). Thus the major allele in mother (G) becomes the minor allele in child – a remarkable frequency change due to mitochondrial bottleneck! This entire analysis is available as a Galaxy history that you can import into your Galaxy account and play with. Variation in human mitochondria is a proxy for other haploid systems. Nucleotide variants in haploid systems may have any frequency between 0 and 1.
for strand bias and read placement bias. FreeBayes can be effectively used to call variants in haploid systems. This material is the result of a collaborative work. Thanks to the Galaxy Training Network and all the contributors ( Anton Nekrutenko)!